Reward with Laser Engraved Baseball Trophies and Awards! If you have a bigger budget, crystal and glass awards are the perfect way to truly show your appreciation. However, you can usually achieve the same effect with less expensive acrylic awards. These come in an array of shapes, including stars, octagons, and pedestals with baseballs on top. In addition, we are happy to engrave your custom message directly onto the award. This is an excellent way to say "thank you" to your sponsors and administrative staff. We have it all whether you are in need of trophies for females or males, pitchers or batters, adults or children. 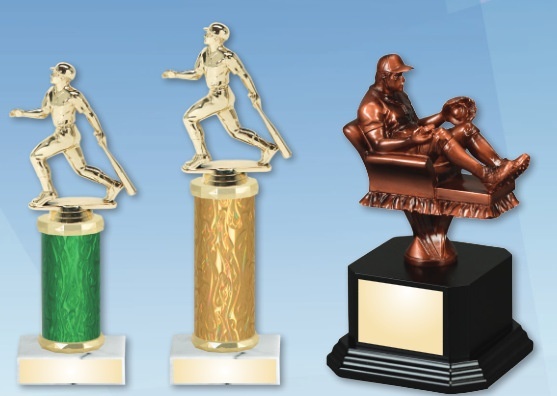 Several of our trophies feature small statuettes of baseball players in different action positions. They also come in a variety of sizes from four inches to 31 inches tall. Additionally, we can include tiny baseballs that actually spin. Trophies can also be custom designed to be any style, color, or size. This year’s hot trophy is bobblehead baseball players stepping up to the plate. Our custom engraved plaques come in all sizes and shapes. With our array of pricing points, we will also meet your budget. The most affordable choice is standard, top-quality plaques. If you have a little extra to spend, we suggest going with premium plaques. These include walnut, rosewood, red alders, and other solid wood options. This is just a snapshot of what we have available. If you have something in mind that is not covered above, give us a call. We will give you an honest assessment of whether or not we can make your dream a reality and how much it will cost. We are the ideal place to start your preparations for your end-of-year awards ceremony. We will manufacture your trophies to your specifications and have them for you in time for your event. If you want to buy laser engraved baseball trophies and awards online, contact The Trophy Studio today.